The pilot project is the first part of an integrated effort called Urbanova, a smart city living laboratory in the 770-acre district that is testing solutions to address urban challenges in new ways. The effort aims to share its findings and create sustainable cities that use fewer resources while increasing their livability and economic vitality. Urbanova got underway last year and includes several public and private partners, including Avista, the City of Spokane, Itron, McKinstry, the University District Development Association and WSU. At the same time, WSU is supporting a new research initiative through a $1.5 million grant focused on Urbanova and smart city technologies and applications. As part of the project, researchers in the Laboratory for Atmospheric Research worked with Avista and Itron to install three air quality sensors on streetlights north of I-90 and east of Division Street adjacent to Spokane’s downtown core. The sensors, located in strategic locations, will capture a variety of air quality conditions near an Interstate 90 interchange, next to railroad tracks and the Amtrak train station, and in a residential neighborhood north of the WSU Health Sciences Spokane campus. These mark the start of a dense network of the sensors to be deployed throughout the university district. Helveticka_air sensors installed in Spokane U-District. 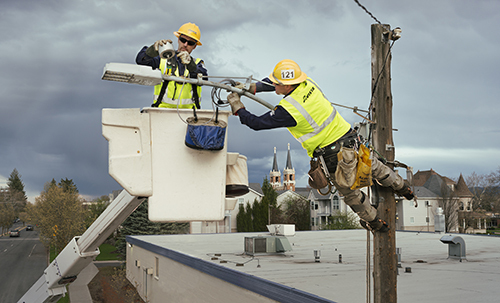 Photos courtesy of Avista Utilities. The sensors collect data on weather conditions, carbon dioxide levels and particulates.. Particulate levels are of specific concern because they impact human health, including heart and lung disease. Spokane is one of hundreds of similar midsized U.S. cities rarely studied for air pollution, said Von Walden, professor in the WSU’s Department of Civil and Environmental Engineering, who is leading the air quality aspects of the Urbanova project. The network also will provide unique and valuable information about how summer wildfires affect air quality and pollution in urban environments. The network’s fine spatial grid will be used with advanced weather and air quality models to improve our understanding of microclimates in urban areas. “This is a next step for documenting personal exposure to pollutants at the scale where we live and work, and it will give us a direct link between local air quality and human health impacts,” said Brian Lamb, Regents Professor in the Laboratory for Atmospheric Research. The researchers will install several more sensors later this year, and researchers from the WSU School of Electrical Engineering and Computer Science are developing a software platform to integrate, store and analyze the air quality data, as well as data from the power grid. They will make the real-time data on pollution levels publicly available.